HatLine Productions acquires highly acclaimed Ben Blackshaw series by author Robert Blake Whitehill. Fans of James Bond (Sean Connery, Daniel Craig) movies and the Jason Bourne (Matt Damon) series will delight in this highly addictive series about a former Navy SEAL. HatLine Productions has begun development of DEADRISE, the first of three adaptations they’ll produce from the Ben Blackshaw action/thriller franchise, with scripts written by the novels’ author, award-winning screenwriter Robert Blake Whitehill. Diving the icy Chesapeake for oysters, former SEAL Ben Blackshaw finds the wreck of a speedboat sunk with a fortune in gold and a dirty bomb, its timer ticking down to zero just 24 hours away. Blackshaw also finds the corpse of a man he hasn’t seen in 15 years—his father. Psychotic NSA operator Maynard Chalk attacks Blackshaw’s native Smith Island to recover the cargo. If Blackshaw can’t repulse Chalk’s savage crew, he forfeits his home, the gold, the love of his life, and the opening skirmish of World War III. For more information, please visit author Robert Blake Whitehill's Official Website. 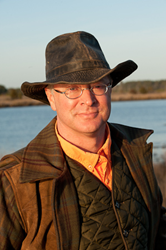 Robert Blake Whitehill, the top-rated TV crime writer and award-winning screenwriter, was raised on Maryland’s historic Eastern Shore. With a screenplay triumph at the Hampton’s International Film Festival (as an Alfred P. Sloan Foundation Fellow) and another win at the Hudson Valley Film Festival, Whitehill has now penned the critically-acclaimed Ben Blackshaw Series of thrillers set in his native Chesapeake Bay. Whitehill's other optioned screenplays, past and present, include projects with Howard Stern and Ben Barenholtz, as well as a fresh, edgy comedy about three women supplementing their Social Security by committing murder for hire. HatLine Productions was founded in 2011, and is also producing a spy thriller set against the fall of the Berlin Wall. HatLine’s mission is to bring to market the commercial embodiment of an author's creative vision, delivering a product that can be packaged, produced, and distributed to compete at the highest levels in today’s marketplace. For more info, please visit the HatLine Productions website.